Opening March 26, SCRAP has revealed that the first Real Escape Room in their new location in San Francisco's Russian Hill neighborhood will be "Escape from the Jail." Running simultaneously with their escape rooms in Japantown, "Jail" and future games at 1812 Polk Street are expected to double SCRAP's SF offerings. Like all of SCRAP's games, this escape room is designed to be enjoyable by anyone regardless of experience or skills. Opening March 26, SCRAP has revealed that the first Real Escape Room in their new location in San Francisco's Russian Hill neighborhood will be "Escape from the Jail". Running simultaneously with their escape rooms in Japantown, "Jail" and future games at 1812 Polk Street are expected to double SCRAP's SF offerings. In the Bay Area alone, about 100,000 players have already enjoyed Real Escape Rooms. SCRAP recently launched "Escape from the Time Travel Lab" in Los Angeles as their debut escape room in Southern California. Real Escape Rooms are real-world, story-driven puzzle games in which victory is determined by whether a team is able to escape, typically by finding a key to a locked door. Once inside, the team must work together to collect clues hidden within the room and solve a wide variety of puzzles in order to progress. 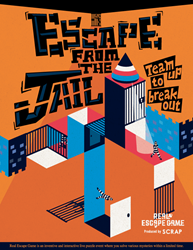 In "Escape from the Jail," players will be held in cells at an inescapable prison. Communication from one cell to another is limited, but players must find a way to collaborate and escape as a single team. As it is known to do, SCRAP will incorporate a number of unique twists on this classic theme. Like all of SCRAP's games, this escape room is designed to be enjoyable by anyone regardless of experience or skills. For the optimal experience, a team of 11 is recommended. Smaller groups are also welcome, as the company allows multiple groups to buy tickets separately and come together as one team upon arrival. Established in Japan in 2007, SCRAP Corp. debuted the Real Escape Game concept in Kyoto and followed up with the first permanent Real Escape Room in 2010. Since then, over one million people have participated in games run by SCRAP and its partners throughout Japan, China, Singapore, France, Spain, Canada and the United States. SCRAP recently set a new North American attendance record during "Escape from AT&T Park" with 6,000 players in a single day.